Let’s start our little tour in my favorite place, the vegetable garden. 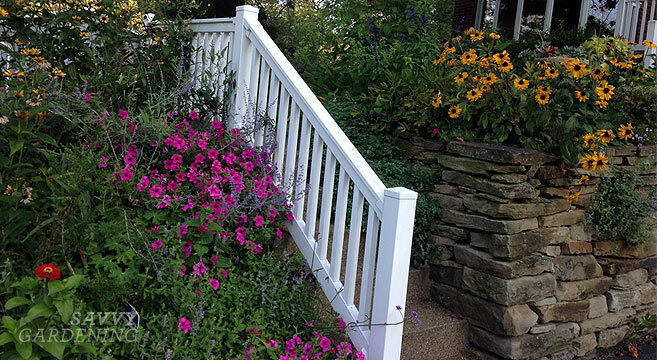 I designed the garden for accessibility and promotion of beneficial insects. The garden measures 30′ x 25′ and is divided into four quadrants separated by straw paths. 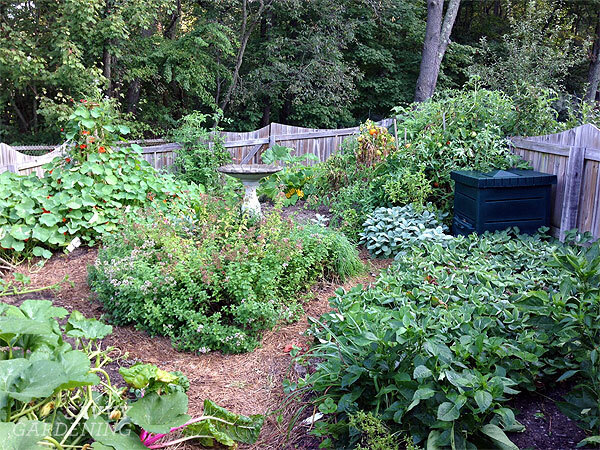 My vegetable garden is centered with an “herb island” that includes perennial herbs like oregano, sage, chives, fennel, and thyme. I scatter flowers throughout the garden in hopes of attracting and supporting beneficial insects to help with pest control. 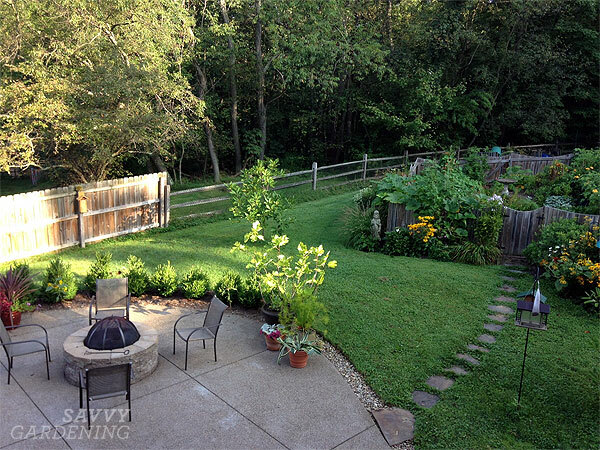 This is a view of the fire pit and vegetable garden from our upstairs balcony. We had the exposed aggregate patio put in a few years ago and absolutely love it. The fire pit was a “must-have” for us. You can also see a few of my container plants in this shot – including a fig tree, an agave plant given to me by garden guru P. Allen Smith, and a papyrus plant. And this is the other half of our patio. When we installed it, we had the backyard regraded and the block retaining wall built to separate the upper play yard from the patio area. I built the stone wall to the right myself, using stones that were once an oddball waterfall feature in the corner of the yard. It took me about a month to build it, but I loved piecing the stones together like a puzzle. When we first moved into the house seven years ago, there was not a single plant in the front of the house – it was grass, right up to the front door! One of the first things I did was get rid of the grass on the bank along the driveway and install a flower border. 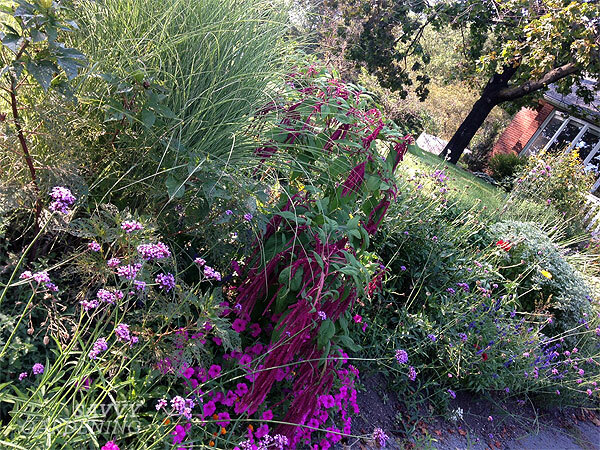 It’s about 30′ long and 8′ wide and contains a mixture of perennials, ornamental grasses, bulbs, and annuals. I love pulling into my driveway every day and seeing all the color. We also have a smallish butterfly/beneficial insect garden on the side of the house. I grow a lot of self-sowing annuals here, along with a dozen or two different perennials. 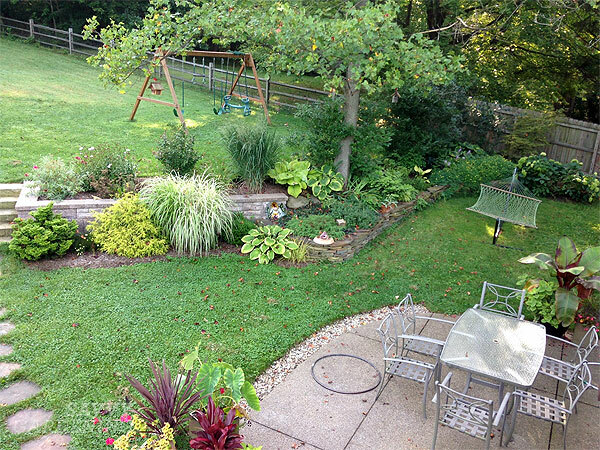 The area is only about 12′ x 12′, but this part of the yard is constantly buzzing with life. 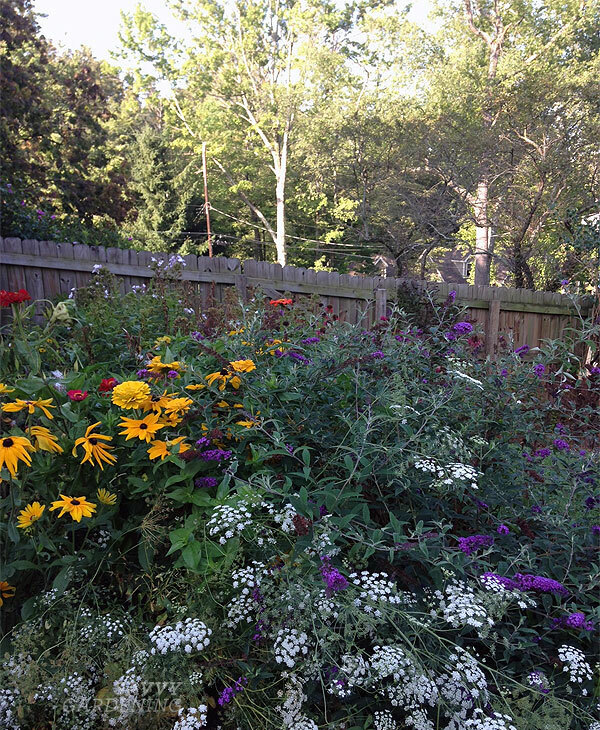 The white-flowered Ammi majus in the front is one of my favorite annuals to grow from seed. We rebuilt the freestanding rock retaining wall at the top of our driveway a few years ago, and last fall we had a new front porch and walk installed to match the exposed aggregate patio in the back. I’m so happy with the results! Jessica, it’s so lovely! What a wonderful place to raise a family.